Zhengzhou CamelWay Machinery manufacture produces tower cranes, construction elevators, concrete mixing stations, JS concrete mixers, concrete batching machines, stabilized soil mixing stations, wheel loaders, concrete transport tanks, JZC concrete mixers and other construction machinery. The company has an extensive user base in the country, enjoying a high popularity. Some products are exported to Vietnam, Laos, Kazakhstan, Mongolia, Russia, Cuba, Brazil and other countries, being highly praised by foreign friends. Then we will introduce hzs series concrete batching plant to you. 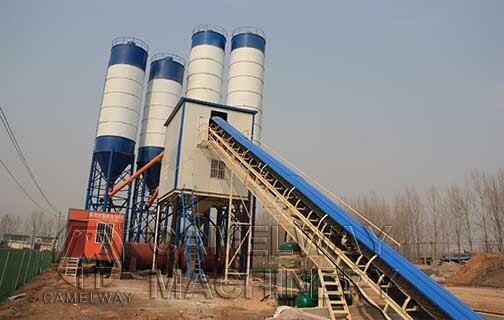 The concrete mixing plant is a combinational device used to mix concrete in centralized. There are many different types and components of the concrete mixing plants, the basic structure includes: Feeding system, measuring (weighing) system, mixing system, electrical system and auxiliary equipments (such as air compressor, water pump etc. ). They are used to transport, feed, store, batch, weigh, mix and discharge the concrete raw materials: Cement, water, sand, crushed stone, admixture and additive. Which Security Measures Should be Taken for Computer System of Mixing Plant?